Craving for Pinoy foods?! Or wondering where to hang-out during Friday and Saturday nights listening with acoustic music?! Well, "Tambayan Sa Kanto" is the place you are looking for! 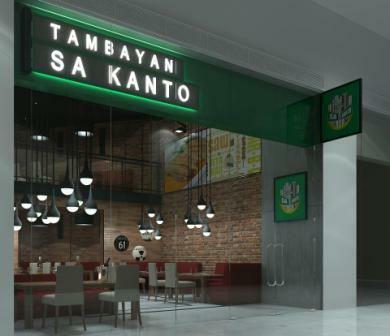 Located at the Ground Floor of The Podium in Ortigas Center, Pasig City, "Tambayan Sa Kanto" is a bar and restaurant offering Filipino Cuisines! This is the place where you can find all the different Pinoy dishes of the different regions. Our very own special Pinoy foods like laing, adobo, lechon, longanisa, pancit, lumpia, bangus, etc. were all here! It even gives you a taste of special Filipino desserts like turon, halo-halo, and different kakanins. This resto-bar offers an Eat-All-You-Can buffet promo for only Php399. The lunch buffet starts from 11am to 3pm. Afterwards, the dinner buffet opens from from 6pm to 10pm. Now, Tambayan is serving breakfast starting at 6am. The Sign That Everybody Loves! 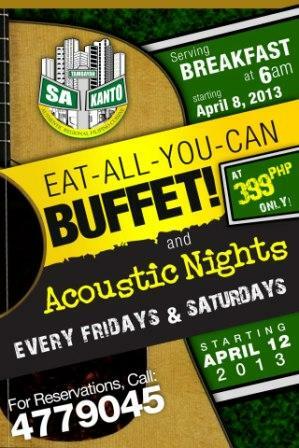 Aside from All-Filipino cuisines and Eat-All-You-Can promo, Tambayan is also offering "Acoustic Nights" during Friday and Saturday nights. Different artists like Chris Cayzer, Janjay Coquila, Ali Alijandro, Vince Alaras, and Aliya Parcs were featured in the said show performing their very versions of the different hit songs. The event starts at 9pm and ends at 2am.